HOLLAND, Mich. — Elzinga & Volkers (E&V), a leading provider of construction management services, closed out 2016 with an increase in new hires, projects and the announcement of a new office – marking another strong year of growth. In 2016, E&V added 24 new employees to their team, began construction on a new location in Coldwater, Mich., achieved 3,500 days of no lost work time due to an accident and completed more than 2,000 projects. Since July 2016, E&V saw 25 percent growth in personnel. Of the new hires, 13 are new field personnel, six were added to the management team and two were administrative support hires. In recognition of E&V’s continued efforts in the construction industry, American Subcontractors Association of Michigan (ASAM) named E&V Michigan’s Contractor of the Year (MCOY) – an award recognizing one organization that exhibits best practices, professionalism and collaboration with Michigan’s subcontracting community. As demand continues to increase throughout the region for construction services, E&V expanded into Southern Michigan with a new office in Coldwater. Opening in early 2017, the office will support traditional construction management services in southern Michigan and Northern Indiana, while also managing E&V’s Facilities Services Division (FSD), dedicated to maintenance and small capital projects nationwide. •	Grifols: E&V completed dozens of projects nationwide, from Ill. to Calif. and Nev. to La. These ranged in size from $130,000 to $3,500,000. 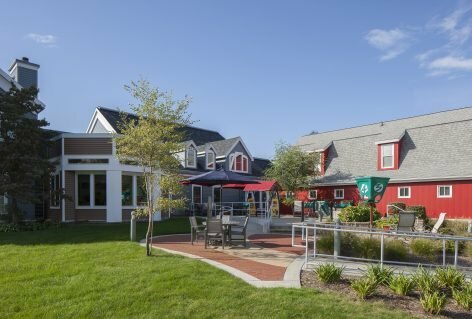 •	Ronald McDonald House Western Michigan: E&V completed a full renovation to an existing 18,000 sq. ft. housing facility. The project included new floors, wallcovering/paint, new HVAC system and upgrades to security and fire alarm systems. •	Pine Rest Flex Bed Unit: Construction started on a 35,000 sq. ft. addition to the existing facility. The new space will be used for the treatment of adolescent and young adult psychiatric patients. •	Hope Church: E&V managed a 10,000 sq. ft. renovation of the youth area, nursery, gathering area, meeting rooms and administrative offices. Additionally, a 3,600 sq. ft. addition of a new chapel provided an alternate worship area. •	Kendall Electric: E&V completed a 26,000 sq. ft. build over the existing facility as to not interrupt operations. Once the build was complete, E&V assisted with the demo of the pre-existing 11,200 sq. ft. facility. In addition to the many business achievements, Elzinga & Volkers also highlighted the birth of eight new babies from its team members, two marriages and the donation of over $150,000 to West MI charitable organizations in 2016.